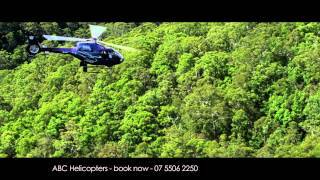 ABC Heli offers a range of helicopter tours and charters on the beautiful Gold Coast. They have a long history and a very well established scenic joy flight and charter business located on the Southern Gold Coast. Their crew and "VIP" luxury helicopters will ensure your flight is the best possible experience ever. Leaving from the Gold Coast Airport at 500 feet, this Scenic Joy Flight tracks north along the beach past Burleigh Heads along the beautiful Gold Coast beaches and past the amazing high rise of Surfers Paradise and main beach, flying past local icons such as Jupiter's Casino, the Gold Coast Convention Centre and the Q1 building. Abeam the main Beach High rise, they climb for the skies and return at 1500 feet over head the Bond University for a touch down at the airport. A great way to see the extensive man made canals and waterfront homes of the Gold Coast. Come and experience a helicopter scenic Joy Flight along this Spectacular part of the Gold Coast. 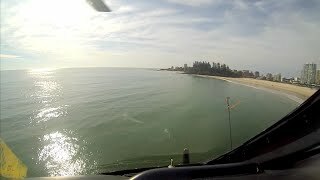 Taking off from Coolangatta they will head towards the famous Snapper Rocks (home of the Quicksilver and Roxy Pro). Fly 500 feet along the beautiful Greenmount and Rainbow Bay beaches and headlands, taking a glimpse at the surfers riding some of the best waves on the planet. Banking left at the mouth of the Tweed River and Point Danger, they will begin the journey north. Flying coastal all the way to Burleigh Heads, you will rush along Currumbin Alley, Palm Beach and Tallebudgera Beaches. The Surfers Skyline in the distance is a great sight with it's many high rise buildings, the most prominent being the Q1 standing 1000 feet tall. At Burleigh Headland they will bank the helicopter for the return back to Coolangatta. Looking to your right you will see Mount Warning standing proud in the Tweed Valley, having just overflown the remnants of its eruption some 300 million years ago with the black "Lava Rocks" that peppered the Burleigh Headland. If you want a flight that showcases so much of the Gold Coast, then this is it! This is the tour with the lot, a full 30 minute Scenic Joy Flight covering all aspects of the Gold Coast. Initially departing Coolangatta Airport, they will head north along the immaculate beaches to Main Beach and the spit at 500 feet, with full views of the Gold Coast, Stradbroke Island and the thriving Hinterland. From here, they'll climb up to 1500 feet and head south over Skilled Park, (home ground of the Gold Coast Titans) then the Tweed and Currumbin Valleys and not to mention the stunning views all the way down to Byron Bay. Fly down to the Tweed River where they will descend to 500 feet and follow the meandering river, back to Coolangatta via Point Danger and Snapper rocks.